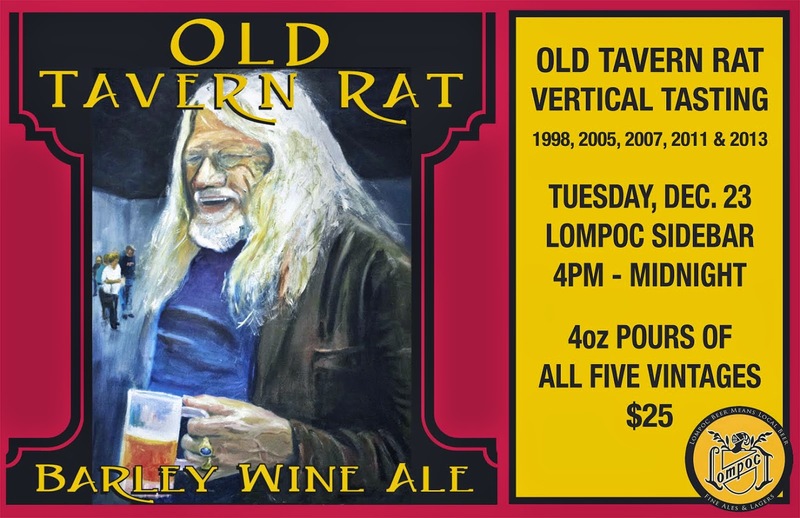 Lompoc Brewing is holding a five-year vertical tasting of its popular Old Tavern Rat Barley Wine Ale. The event will take place on Tuesday, December 23 from 4pm to Midnight at Sidebar, 3901 N Williams Ave. The years featured include 1998, 2005, 2007, 2011 and 2013. A flight of 4-oz pours of all five vintages costs $25. Old Tavern Rat was named in honor of the famed Portland publican Don Younger, the business partner and close friend of Lompoc owner Jerry Fechter. Though the flavors vary with each batch, the beer is generally a very intense (like Don) strong ale with a malty body and plenty of caramel, dried fruit and roast flavors. The beer’s label is a painting of Younger done by the talented John Foyston, local beer writer and painter. A Portland staple since 1996, Lompoc Brewing creates seven flavorful year-round beers, plus a ridiculous number of seasonals. You can find Lompoc in 22 oz bottles and on draft at locations around town, and at its five neighborhood pubs: Fifth Quadrant and Sidebar in North Portland, Hedge House and Oaks Bottom in SE, and the Lompoc Tavern in NW. For more information, visit www.lompocbrewing.com.